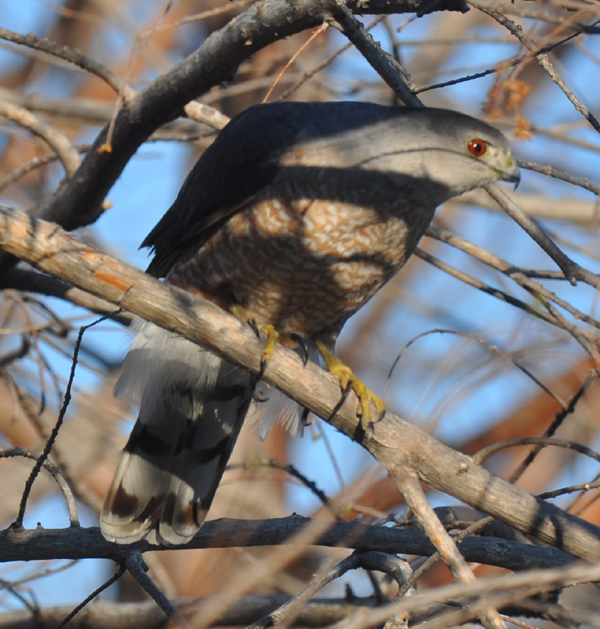 The Cooper's hawk hunts from a vantage of stealth and pursues his prey with a great burst of speed. He may run along the ground in pursuit of a small mammal. Here are the hawk's lethal weapons. 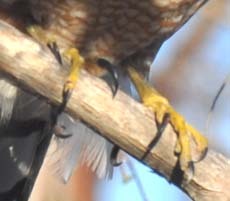 The middle digit (D3) is almost twice as long as the toes on either side of it, but its talon is smaller. 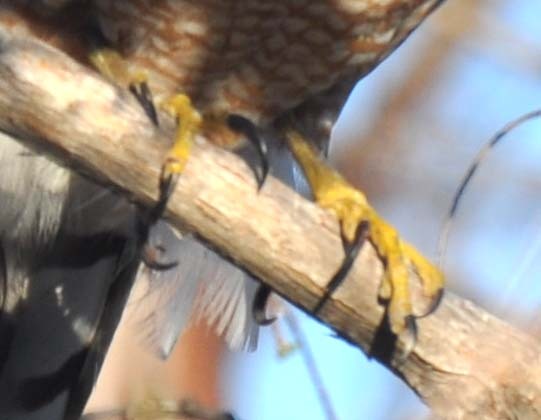 The talons of D2 and D1 (the hallux) are scythe-like and nearly the same size. The typical Cooper’s hawk habitat is a copse of tall trees with good canopy that is beside a clearing like a streambed. It makes little difference to the hawk if this choice is a riparian forest or a city greenbelt, as long as the wood is populated with prey. He would likely prefer his neighbor to be a human than a sharp-shinned hawk, his rival for prey. 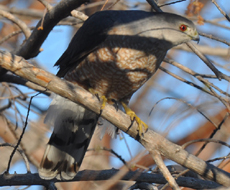 The Cooper’s hawk uses a variety of tactics to pursue and capture his prey. Most often he conceals himself among the leafy boughs of a tree and awaits an unsuspecting bird, which he will pursue with a great burst of speed, capturing the bird with his talons. Using his long toes and talons, he squeezes, releases, and squeezes the bird until it no longer moves. He then plucks the feathers from the bird and consumes it in its entirety. The hawk prefers small- to medium-sized birds, such as doves, starlings, jays, grackles, pigeons, quail, and... yes... even chickens. 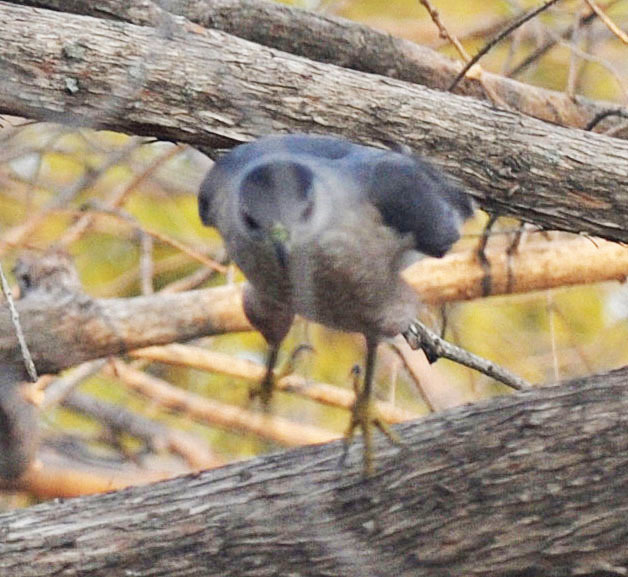 The Cooper’s hawk will pursue his prey swiftly and fearlessly into the brush and limbs of a tree, sometimes at his own peril. It is not unusual for the hawk to live out his days with a naturally-healed pectoral bone fracture. An opportunistic feeder, the hawk also hunts for a variety of live prey: small mammals – mice, rats, squirrels, chipmunks, gophers, rabbits, etc. – and occasionally reptiles, amphibians, insects, and even fish. 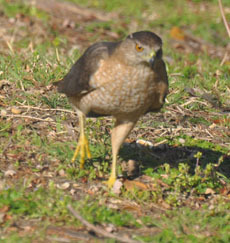 The hawk may run along the ground or stoop from flight as a means of capturing prey. 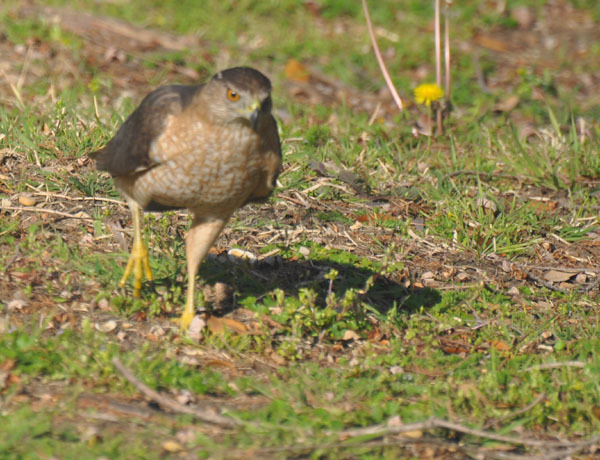 Cooper’s hawks have also been known to drown their prey in water. Nest predation is not uncommon.